Bosch and IoT. One of the three top trend for IoT for 2014 is the industrial internet. The connecting of electromechanical assets, building networking into new components and connecting our cities can yield tremendous cost savings, environmental improvements and safety enhancements. Bosch has been a leader in IoT for several years and has recently taken steps to solidify that position. 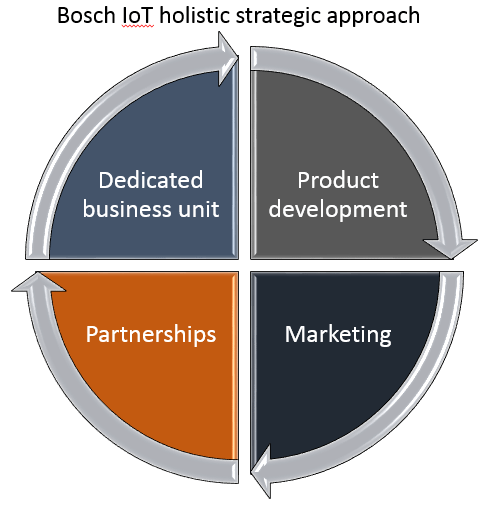 Success does not come overnight, but Bosch is doing the right things to be successful in IoT by (1) setting up a dedicated business unit, (2) conducting specific IoT product development, (3) creating effective marketing and (4) engaging with viable partners. Let’s take them in order. See figure below. 1. Bosch has recently formed a new company for the Internet of things and services called Bosch Connected Devices and Solutions GmbH. The company is in Reutlingen, Germany, but will also have sites in India and China. Having a dedicated business unit or company for IoT development is critical, because IoT touches so many areas of an existing business. My belief – someone needs to take ownership of the process if one expects success. Bosch’s decision to set-up a separate IoT company is spot-on. 2. Bosch’s existing business units (e.g. Mobility; At home; Industry and trade; Software solutions; and Healthcare) will create IoT-ready products. However, it’s also nice to know that Bosch Connected Devices and Solutions will supply connected compact electronic products — sensors for smart homes, traffic management, transportation and logistics — and enabling software. These are all growth areas for IoT. 3. Bosch has engaged in effective marketing with segmentation, prioritization and various outreach activities. Some of the most successful marketing activities have been Bosch’s work on the smart house of the future. Bosch Software Innovations also has a very successful IoT blog that addresses various issues associated with the IoT ecosystem including IoT business models, insights on changes in the IoT world, predictive maintenance, energy management, connected cars, various blogs on security, and a strategy piece on the interconnected future by Volkmar Denner, chairman of the board of management of Robert Bosch GmbH and a limited partner of Robert Bosch Industrietreuhand KG. These marketing activities create awareness in the market of Bosch’s IoT work and overall thought-leadership. 4. Bosch recognizes the need to empower a strong network of partners to make IoT a reality. As such, it has engaged with academic institutions like University of St. Gallen to create an IoT lab, large IT vendors like Cisco and operators like Vodafone. No one vendor can supply all IoT solutions, so viable partners are critical. We look forward to hearing more about Bosch’s IoT developments and the successes of the new company.